I’ve always been amazed at the time and energy some people put into creating gorgeous, full, Christmas trees. Can I be honest? I’ve never had the energy (or time) to spend ALL day decorating a Christmas tree. This year, I’ve learned a little ribbon hack that has changed everything! 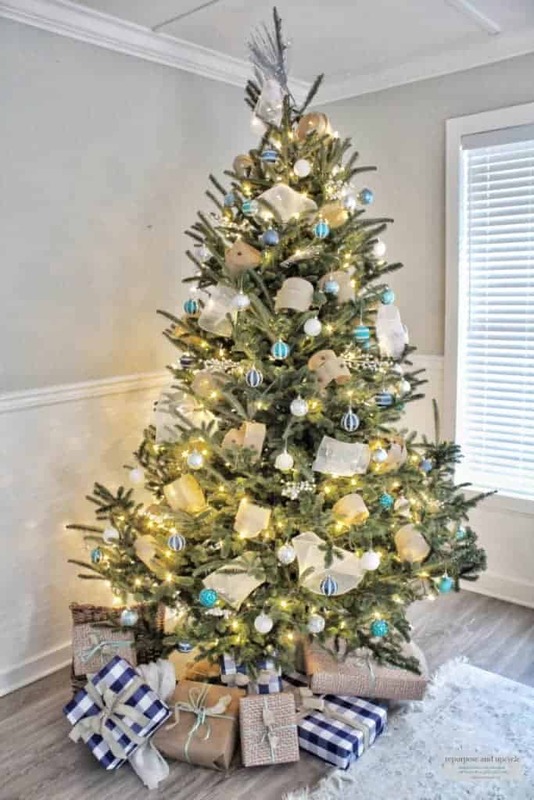 I can’t wait to share how I decorated my tree with a coastal Christmas theme and a neat Christmas tree ribbon hack video. If you are here from Jen’s blog Noting Grace, then welcome. Jen has fabulous farmhouse style and so many fantastic DIY’s. I’ve always loved Christmas trees with a lot of ribbon. I don’t, however, love to add ribbon to a tree. Is it just me or does it seem so labor intensive? Maybe I’m just being dramatic, or maybe I’m just lazy! 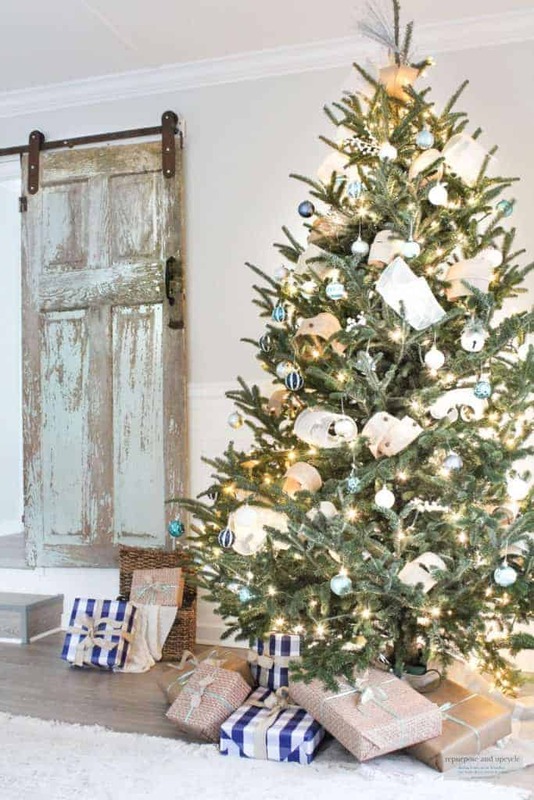 Ready to see a super easy coastal themed Christmas tree ribbon hack? Check out my YouTube video below for all the details. If you enjoy the video I would love for you to subscribe and follow along with all my DIY shenanigans and decor tips and tricks. Wasn’t that ribbon hack easy? I wish I had know about the Christmas tree ribbon trick a long time ago. 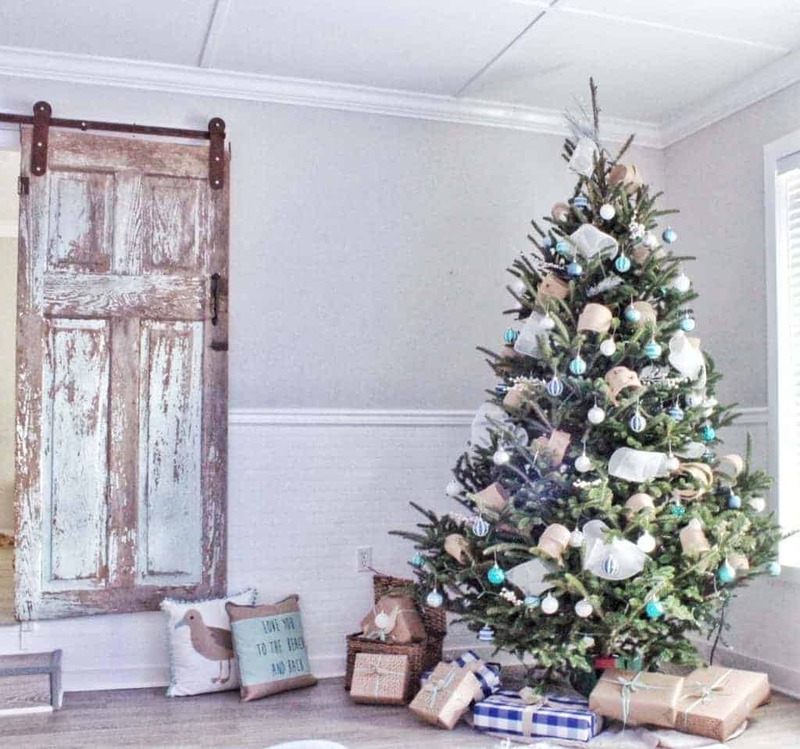 This year I wanted to create a coastal Christmas theme with different shades of blue and lots of natural jute colors! I hope this ribbon hack has given you a tool to create your own “professionally decorated” Christmas tree. 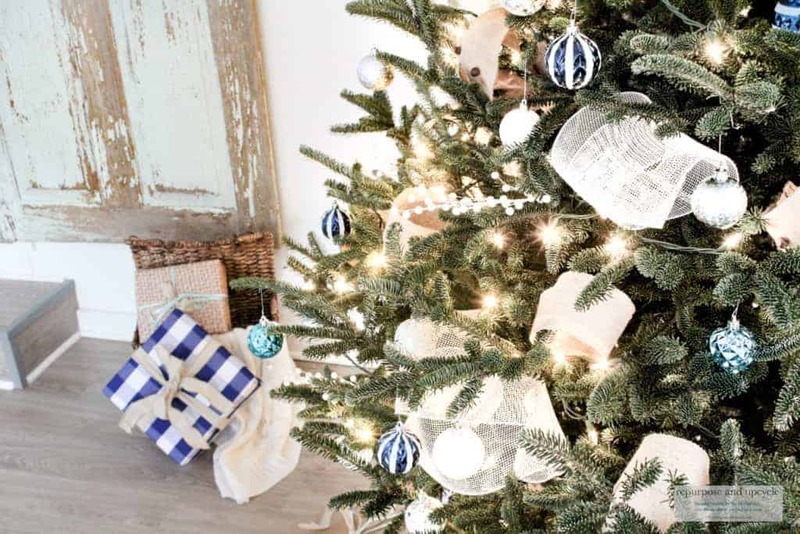 Stick around and check out a few other bloggers Christmas DIY’s. Next on the list is Bree, The Homemaking Momma, with her handmade felt garland. I love that ribbon technique! I have to admit that I’m ribbon challenged. 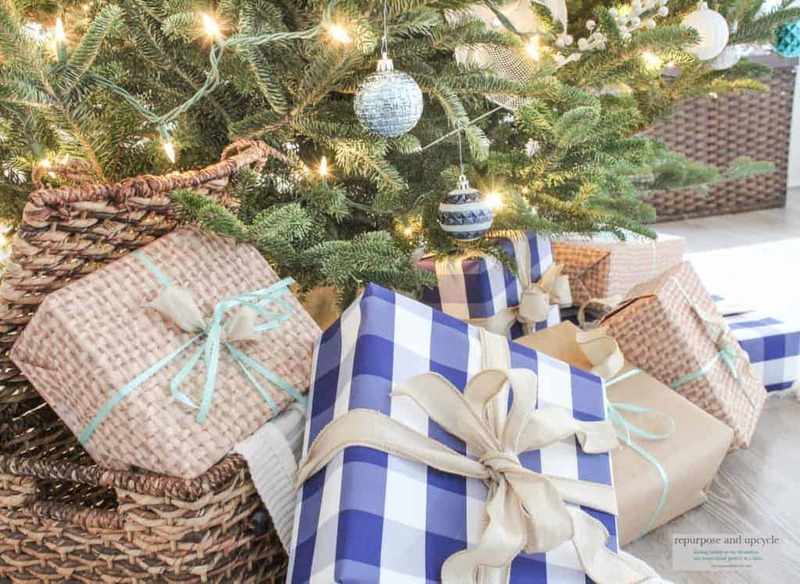 And I’ve been eyeballing that wrapping paper – I love that burlap paper. It’s a perfect match for this tree! Gorgeous my friend! Thank you Jen! It was fun to do! Oh my goodness! I love your ribbon tutorial! Thanks so much for sharing. Thanks Leslie, what a game changer! Lindsey what a great ribbon hack and I love your coastal tree! Such great inspiration! Thanks Kelly! It was fun. I love this hack and the colors of your tree! That’s so smart, Lindsey! I’m going to have to try that next year! I just love all those shades of blue! So pretty… we toured a Newport mansion yesterday and their trees were just breathtaking! I didn’t really think much of it but I bet it took them a long time to get them all looking so perfectly perfect. 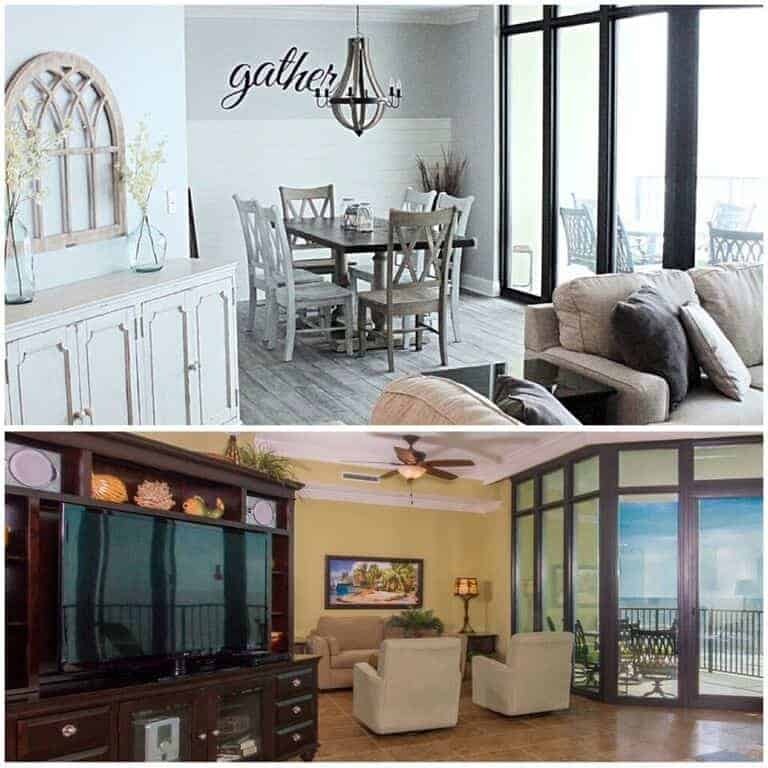 I love the coastal theme. The blue and white looks so pretty. Lindsey, what an ingenious idea. You will be loved by bloggers everywhere. Thank you for sharing at Happiness is Homemade Link Party. I’m choosing you as one of our features for this week. Great tip – and your tree is beautiful! Just to let you know, I featured your post this week at Best of the Weekend! Stop by tonight to see your features and the others. Merry Christmas! That is so pretty! I love the ribbon trick. Thanks for sharing this with us at the Homestead Blog Hop. Please come back again soon!